This week has been a big one for the nation's banks. And after sitting on pins and needles, Bank of America investors can finally begin to celebrate. The Federal Reserve's release of their second round of stress test results has been a big boon for B of A, as it sailed cleanly through both tests and received the green light for its capital plan. Up 3.9% so far in trading, it's clear that Mr. Market approves of the bank's performance, too. Though investors won't be receiving a newly increased dividend payment from B of A, they are happy with the bank's plans for a $5 billion share buyback program, as well as the $5.5 billion redemption of two of the bank's preferred stock. Both will provide value to its shareholders, a clear goal of CEO Brian Moynihan, who stated in 2011 that he was aiming at buying out all of the shares issued during the financial crisis that created a huge amount of dilution. B of A investors also have to be happy about the decidedly less favorable outcome for two of the bank's rivals, JPMorgan Chase and Goldman Sachs . Both are required to submit new capital plans to the Fed by the third quarter to address weaknesses identified in their current plans. Though the Fed did not object to JPM's or Goldman's current plans, it did note that the weaknesses were significant enough to require immediate attention. With Bank of America trading at such high volumes, this positive news from the Fed has really created an environment where the stock's price could appreciate to the $15 target some analysts have been predicting. But the volatility that comes with increased trading volume could also sap the bank's momentum at any new piece of negative news. In the coming week, investors should keep any eye on B of A's movement due to the possible impact of Wednesday's FOMC announcements and forecast. Ben Bernanke will be speaking on Wednesday to disclose the most recent policy developments from the FOMC, and B of A has proved to be the most vulnerable bank stock when it comes to policy concerns. As most here at the Fool would tell you, basing any investment decision on one day's price movements would be foolish (note the lowercase "f"), but being educated on the factors that can move your stock's price will help make you a better investor, capable of weathering the price fluctuations of any particular day. As today's moves prove, there are certain events that can shed light on how a bank is managing itself and if it continues to be a good investment opportunity. 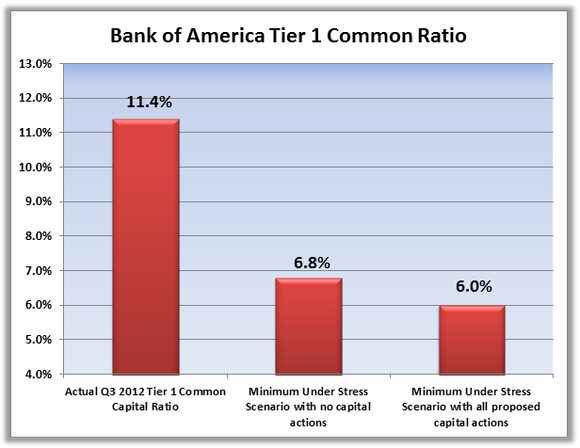 By having the best Tier 1 common capital ratio of the big four banks, Bank of America has highlighted its strengths once again -- making it a clear investment opportunity. After all, Bank of America's stock doubled in 2012. Is there more yet to come? With significant challenges still ahead, it's critical to have a solid understanding of this megabank before adding it to your portfolio. In The Motley Fool's premium research report on B of A, analysts Anand Chokkavelu, CFA, and Matt Koppenheffer, Financials bureau chief, lift the veil on the bank's operations, including detailing three reasons to buy and three reasons to sell. Click here now to claim your copy. The article Bank of America Soars After Fed Approval originally appeared on Fool.com. Fool contributor Jessica Alling has no position in any stocks mentioned, but you can contact her here. The Motley Fool recommends Goldman Sachs. The Motley Fool owns shares of Bank of America and JPMorgan Chase. Try any of our Foolish newsletter services free for 30 days. We Fools may not all hold the same opinions, but we all believe that considering a diverse range of insights makes us better investors. The Motley Fool has a disclosure policy.